Luxury spa day at The Cliff House Hotel. 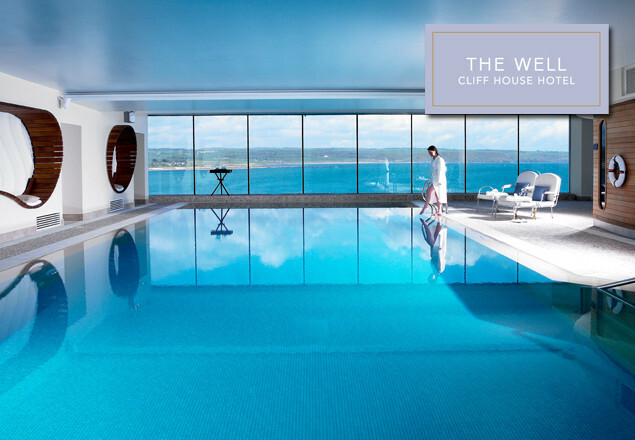 Luxury all-encompassing spa day at The Cliff House Hotel, Waterford. Regarded as one of the finest small luxury five-star hotels in Ireland, The Cliff House Hotel is a seaside boutique hotel in the traditional fishing village of Ardmore. The hotel features a luxury spa, The Well. An indoor infinity-edge swimming pool is The Well’s centerpiece, its floor-to-ceiling windows and ocean views creating a sense of unending space, as if the pool is merging into the Irish sea. For those of stronger constitution, a natural outdoor pool with a diving board is cut into the rocks below. We also have an outdoor heated hot tub and relaxation terrace with two stone baths allow you to benefit from the Irish elements in comfort. Inside, The Well spa offers serene luxury in a light, peaceful, uncluttered space. An all-encompassing day of bliss with our carefully curated Rewarding Times Spa Day – following some time in the infinity swimming pool, outdoor hot tub, sauna and steam room, enter a prepared seaweed bath, looking out to sea. Our bathing therapies take place in special outdoor stone baths, allowing you to breathe the fresh sea air while soaking in a hot bath infused with revitalising, natural products. Whilst in the bath your therapist will introduce a mask and oil into the hair and scalp finishing with a scalp massage and a hot towel wrap – you are then left with to enjoy the experience for a further 30 minutes to maximise the full benefits of the baths. Leaving the bathing ritual enjoy some herbal tea followed by personalised facial with intensive eye treatment. A relaxing full body massage for ninety minutes will complete your day. A totally holistic experience for mind, body and spirit. Full day use of the 15mt swimming pool, outdoor Jacuzzi, sauna and steam room. Prepared seaweed bath plus hot towel wrap with scalp mask, oils and massage. Personalised facial with eye treatment. Individualised full body massage with technique of your choice. Treatments will take at least 3 hours combined but use of facilities is open to clients for the full day. We would recommend you factor in some time for relaxation and use of pool facilities before, during and after treatment. Voucher is for one person. Reservations are essential. Please call the spa to reserve 024 87830 from 8am – 8pm every day. Vouchers are valid from September 1st until December 10th 2012. Vouchers are valid 7 days a week. Limited availability on Saturdays. If you wish to stay overnight at the hotel, please contact them directly for the best rate. Holders of a Rewarding Times voucher will receive a complimentary upgrade (subject to availibility). Prepared seaweed bath with intensive scalp therapy – scalp mask, hot oils and scalp massage €70. Personalised facial to your skin needs with exclusive eye treatment €140. 90 minute full body massage with techique of your choice €140. This is a spa day experience. Treatments cannot be divided up into different days. Savings based on information provided by The Cliff House Hotel.